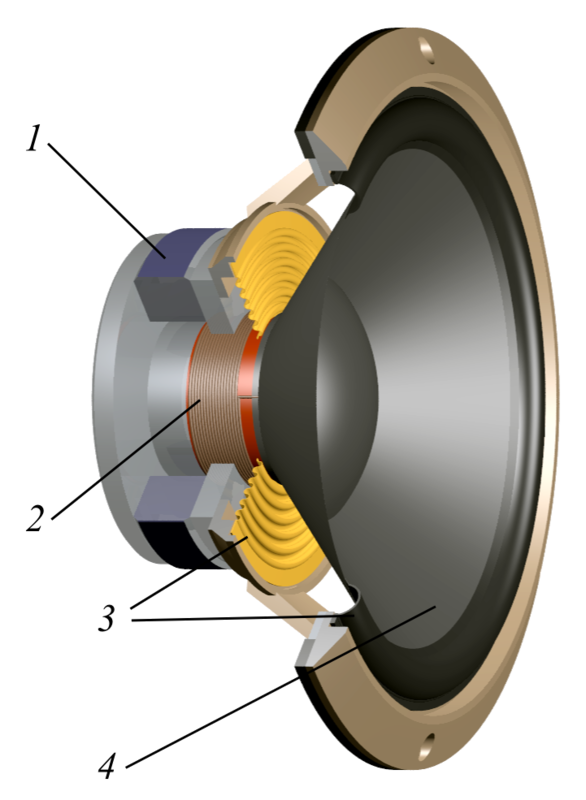 A modern loudspeaker is a crossover technology comprised of electrical and mechanical components. And while this design helps humans enjoy the analog world using digitization, it also creates a complex problem that encompasses the fields of fluid dynamics and electrical engineering. In order to demystify the loudspeaker, two engineers: Neville Thiele and Richard H. Small derived relationships between the physical parameters of a loudspeaker and its acoustic performance. These parameters, called the Thiele-Small Parameters, are still used today to design audio systems and remain a cornerstone for quantifying the performance of such a system [read more about Thiele-Small Parameters here and here, and design aspects here and here]. A few notes on the definitions above: r represents a parameter calculated at the loudspeaker’s resonance frequency. Additionally, e represents a parameter in the electrical domain; m represents a parameter in the mechanical domain, and a represents the acoustic domain. From this point onward, I will use each parameter to define another parameter using specific equation derived by Thiele and Small. This value will be necessary for calculating the electrical damping factor, Qer , and efficiency η0 . Using the wiring method above, we will be able to approximate the resonance frequency of the driver where the impedance is maximum. We will also be able to find parameters relating to the electrical and mechanical properties of the driver. This result is important for many reasons. It allows us to approximate the maximum impedance, Zmax (Rspeaker,max ), which allows us to cite the resonance frequency and also solve for other crutial variables like the damping and efficiency of the system. Therefore, once the resonance is discovered we can begin to calculate other parameters necessary to characterizing the perforamnce of a loudspeaker. An impedance plot of the loudspeaker that I used is shown below for a frequency sweep from 20 Hz - 20,000 Hz. I sampled the impedance over 180 seconds. It was done in three pieces and then stitched together. I used the ranges of 20 Hz - 120 Hz, 120 Hz - 2,000 Hz, and 2,000 Hz - 20,000 Hz. This was done to avoid diminishing the peak and the transition zone between high and low frequencies. I used a sampling period of 1 second, which resulted in a frequency resolution of 1 Hz. Several observations can be made regarding the behavior of the impedance plot above. The first is - there is a clear peak which we can identify as the resonance frequency. For the loudspeaker I'm using, the resonance is located around 86 Hz, but the plot above shows about 93 Hz. In the narrower plot below I show a better approximation of the resonance. The full spectrum sweep identifies the resonance region. There are also a few extraneous peaks that likely represent some sort of noise in the input signal. The noise is likely due to the sampling interval and how the smartphone app handles the sweep. Also - the user may notice an increase in the impedance as the frequency increases toward infinity. This is often cited as an artifact of the speaker's inductance, which can act as a frequency filter (hence the increase in impedance with frequency). The important thing to remember is that we have identified the resonance region of the loudspeaker, which we will further explore in the next section when we discuss phase behavior and approximating the amplitude of the impedance at resonance. There are multiple ways of identifying the actual resonance frequency of a loudspeaker. Many manufacturers will put the impedance response curve on their datasheet, and fewer will include the phase measurement, which is often correlated to the derivative of the impedance. This means that if we plot both the impedance response and the phase, we should see a phase zero-crossing around the resonance frequency. This method is done by hand, not using an FFT. We can still see similar behavior using this method, indicating that the FFT method is accurate (and time-saving). The manual method shown directly above can be used to approximate the resonance, however, I will use the quicker and nearly as accurate FFT method. And in the next entry, we will be doing multiple measurements of resonance at different mass loadings - so the manual method would really time quite a bit of time. In this first entry into the loudspeaker analysis series, I discussed the Thiele-Small parameters and the notion of impedance and resonance. The complex nature of loudspeakers makes this series an educational and diverse topic in engineering. I explored how to find the resonance frequency of a speaker driver and how to use both phase and magnitude to approximate the frequency of the resonance and the magnitude of the impedance at resonance. Both of these values will become instrumental in characterizing loudspeakers and audio systems for use in real-world applications. In the next entry, I discuss how to find the remaining mechanical and electrical properties of a loudspeaker and the applications that they open up in terms of design in acoustic environments.